Special credit to Steven Craig. The Butterfield Overland Mail Trail ran from about 1858 to 1861 on a route that began in either Memphis or St. Louis and terminated in San Francisco carrying passengers and U. S. Mail. It began with the Overland Mail Expedition, which was a test of the route in January of 1858 and took about 25 days. Ultimately, the same general route was authorized by then Postmaster General Aaron Brown to deliver the U. S. Mail. Prior to this, mail was shipped from the Gulf of Mexico to Panama, freighted across Panama and shipped on to San Francisco and other west coast destinations or shipped around South America. John Butterfield was a native of New York, born in Berne in 1801. He began his career in transportation by becoming a stage coach driver at the age of 19 and went on to found stage coach businesses in New York, steamship transportation on Lake Ontario and a trolley system in Utica, New York, his home. In the late 1850s, Butterfield and his associates made a bid for federal mail delivery utilizing a route across the southern US with a view that it could be in service 12 months of the year. Though it was 600 miles longer than a more direct route to the coast, the theory was that it would not be interrupted by winter weather. It allowed for semi-weekly mail delivery and at $600,000 per year, it was accepted. The east to west coast route from St. Louis had the following stops: Ft. Smith, AK, Colbert’s Ferry (near Denison, TX), Ft Chadbourne (about 25 miles south of Sweetwater, TX), Franklin (El Paso, TX), Tucson, AZ, Ft Yuma, AZ, Los Angeles, San Francisco. In all, it ran about 2800 miles and took 600 hours. The route took between three and four weeks counting overnight stops. At its peak, it employed 800 individuals and had 139 relay stations, 1800 horses and mules and 250 coaches. Subject to attack by Indians and bandits, the route was guarded for a time by the 9th Kansas Cavalry. There were apparently two routes through Texas. From east to west, the line entered Texas by crossing the Red River near current day Denison and then came through or close to these towns: Sherman, Gainesville, Jacksboro, Ft. Belknap, Woodson, west of Albany, west of Abilene, Bronte, Grape Creek and angled southwest to between Crane and McCamey. It split west of there with the southern leg going to Ft. Stockton, Ft. Davis, up to Van Horn, westerly to Ft. Quitman and then following the Red River to current day El Paso. The northern leg angled westerly to Pecos, generally followed the Pecos River to the current New Mexico border and from there went west to current day El Paso. 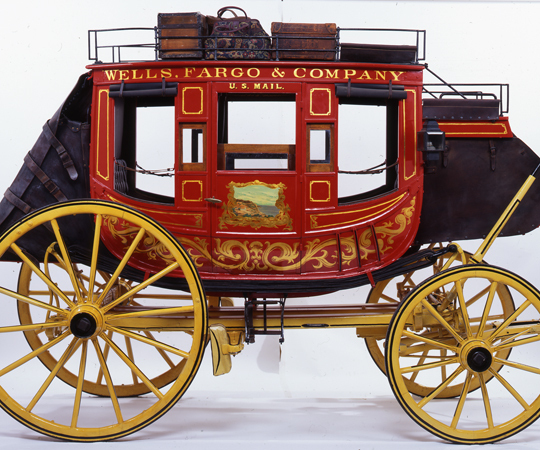 Butterfield had organized the company with partners that included Henry Wells and W. S. Fargo, the namesakes of Wells Fargo to form the original American Express Company which in turn organized the Butterfield Overland Stage Company subsidiary to operate the line. The original charter of American Express was to last 10 years, by its own documentation. In 1860, the stage company was taken over by parent Wells Fargo in settlement of debts and Butterfield was forced out of the business. The entire line itself was discontinued roughly with the outbreak of the Civil War. During its life, the line used two types of coaches. The more familiar stage coaches were used for the early and latter parts of the line were Concord coaches manufactured by Abbot, Downing and Company of Concord, New Hampshire. Lesser known vehicles called stage wagons, or celerity wagons, were used for the bulk of the route. Stage wagons of Butterfield’s own design were manufactured by James Goold Company of Albany, New York. Concord coaches were full bodied coaches while the stage wagons generally had open upper sides and canvas tops over a frame. Both generally were propelled by teams of four horses or mules. 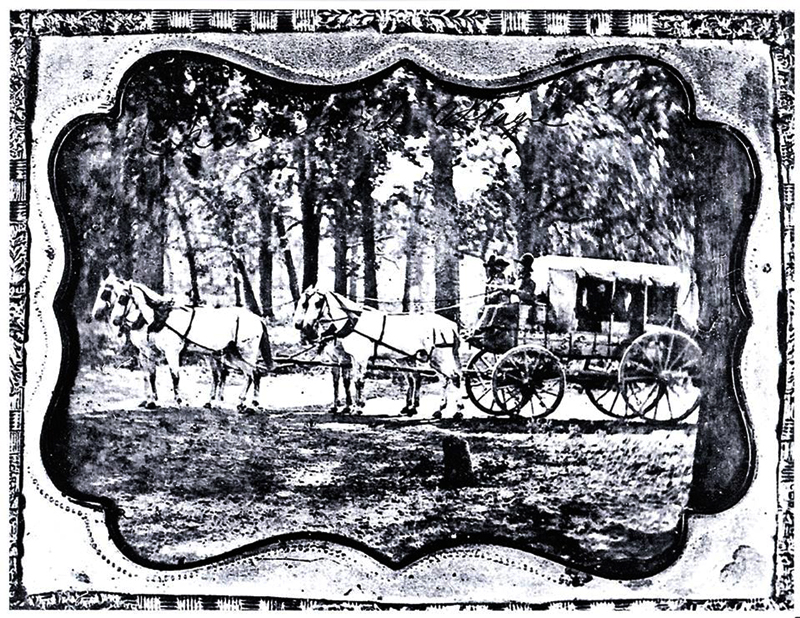 Below are images of typical stage coach and stage wagon designs. Later versions of the stage wagons were more like stage coaches, having solid sides and solid roofs that could accomodate luggage. Mail service was eventually eventually transferred to the expanding U. S. rail system, but horse and mule drawn stages would continue to serve the country for years thereafter. Butterfield returned to his home in Utica, New York after his involvement in the venture was concluded. He died shortly after suffering a stroke in 1869. Keep this goiong please, great job!